Fried Yuba rolls are delicious and can be made using ordinary spring roll wrappers or fried tofu wrappers instead of Yuba. *Yuba is the skin that forms on the surface of boiled soymilk. Sold dried into sheets, it is a high-protein ingredient with a variety of uses. You can use fried tofu skins or even eggroll skins if you can't find Yuba. "What am I going to cook for dinner tonight?" It's a common lament for everyone, and the answer too often is something unhealthy, unappealing, or both in the form of expensive take-out. 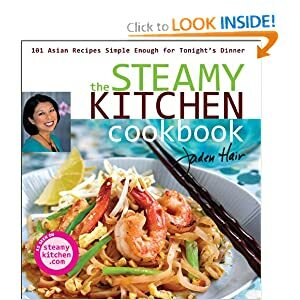 Jaden Hair comes to the rescue in The Steamy Kitchen Cookbook, a fantastic new cookbook stuffed with dozens upon dozens of foolproof Asian recipes that are quick and easy to do—all in time for tonight's supper! 2. Place the yam, shiitake, and carrot in a bowl, sprinkle with salt, pepper, and cornstarch, and mix well. 3. Lay out the yuba slices, divide the vegetables into 8 equal portions and place each portion on top of a yuba slice. Fold the yuba over to make rectangular envelopes, and seal using the flour-and-water mixture. Preheat the oil to 340°F (170°C) and deep-fry the envelopes until golden brown. 4. Cut the yuba envelopes in half and arrange on a serving dish, garnished with salt.